Yarn: Sundara Yarn sport merino, Somewhat Solid in Tan over Cream, 2 skeins (plus a bit of the third for fringe). Finished size: 7″ wide and 60″ long (plus 3″ long fringe). Boy oh boy, this one really worked out! After learning that my mom felted the scarf I knit for dad last year, and hid this indiscretion from him for several months, I did what any good daughter would do: knit him another! And if I do say so myself, it turned out to be new and improved. Sundara’s sport merino is superwash (check!). The yarn is tightly spun and hopefully won’t pill (check!). Thought it’s not Debbie Bliss Baby Cashmerino (one of the few wool yarns which I can wear around my neck), I was quite comfortable during the photo shoot (check!). The color is warmer and more flattering (check!). I included a neat selvedge (pat on the back!). I’m thrilled with the texture and drape – knitting with thinner yarn truly made a difference. The scarf hangs lightly around the neck, folds and flows effortlessly. The original Sharfik, knit out of worsted weight yarn, stood up at attention and felt a bit bulky. You’ll note that I made this scarf 60″ long, though the majority of you advised on the order of 65″-70″. In my head I was thinking 62″ would be perfect for dad – longer than last year, but not so long that it would peek out from the hem of his jacket. I was very close 🙂 – a phone call confirmed that 60″ would be the ideal length. The scarf did stretch during blocking, but then contracted a bit after fully drying. Still, I had to undo the bind-off and take away some length… resulting in needing only 2 skeins of yarn for the actual scarf, and using the third only for a bit of fringe. Better safe than sorry! Now I anxiously await my dad’s verdict. Remember, this time around I chose the pattern, the yarn, and the color myself; he has not had a preview of any kind. Surprise! (I’m sure he’ll love it :)). * Regarding pattern requests: Yes! Just give me a few days. I need to write it up and come up with a clever name (not “Sharfik, v. 2.0”). fantastic! i love how warm the colour is. btw, is the pattern reversible? What a lovely scarf! I’ve been reading your blog for quite some time. Yours was the first knitting blog that I started to read regularly, and I think it had a big influence on me starting my own. Thanks for all the inspiration! That sure looks like a very soft and comfortable scarf, you did a great job on this! Fantastic stitch pattern. Very simple, yet interesting. And the color is great. I’m sure he’ll love it. very handsome scarf indeed!! the name: it screams Trellis at me. Hey, that looks great! I love the color – very appropriate for this time of year. I started a pair of Cable Twist socks after seeing your green ones – they were beautiful! I want to thank you for drawing my attention to the pattern – I really like it a lot! Gorgeous! That is such a fabulous pattern and I hope he likes it. Keep me posted, especially how he feels about the color. 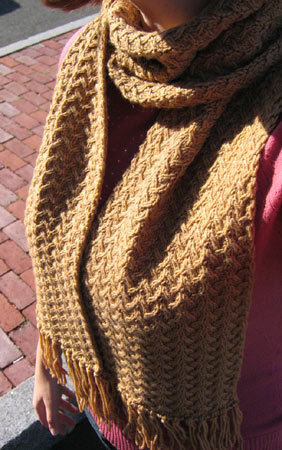 My favorite scarf was knit out of sport weight yarn, too. Although on really cold days I do like bulkier scarves that stand up around my face. Okay…I’ll wait patiently for the pattern. My dad needs one. As for a name, for me it would be “Dad’s Second Chance” but that’s just me! Good work, as usual. You’re going to make this hard aren’t you. I’ve already printed the sharfik pattern and bought the yarn. Just waiting for a free hour to dye it. And now you come up with another equally great scarf. Oh well, I have enough yarn for both. Curiosity strikes….is it the pictures or does the fringe have a slightly different color? i’m sure he’ll love it too, and it’s *mom* (laundress)- proof! it’s a very nice manly colorway and texture. you’re such a good daughter! What great texture. Your dad is a lucky guy! Mmm…love the drapiness and the texture. Gorgeous! It’s gorgeous! I wish my Dad would wear scarves. I’m thinking of knitting him a sweater for Christmas. Or maybe wrapping up some yarn and giving it to him with an IOU saying I will knit it before winter! I’m not all that keen on knitting with wool at this time of year (it’s nearly summer here). Kathy!!! Totally awesome, woman, especially in Sundara’s fab yarn! I so wish I could be making my daddy one…lost him 18 years ago @ 57 yrs young. Just keep making Dad all he wants… I’ll be making one for my 18 yr old son to wrap him in his Gramp’s love. FYI, I came across some Pingouin Corrida No 3 yarn on eBay. Please let me know if you would like to try a couple of these light orange skeins for some socks, and I will see about getting them to you via Mind’s Eye Yarns. i love that stitch pattern…and i could really imagine making it for myself even – fringe included!! another very successful grumpy creation!! Beautiful! You should be proud! I think this is going on my to be knit list. The scarf is lovely. What do you do with your leftover yarn? Save it for repairs? GORGEOUS! I can’t wait for the pattern! You should be pleased with the texture. That edging is very neat and flat. Was that the blocking or did it simply knit up that way by design? I think dad will really like it. cute! your dad is super lucky. i love the scarf without the fringe, too. i’m making my husband a scarf now too, he keeps asking me for the progres. Pret-tay! And I bet that pattern would look neat on a sock too. I have already done the Sharfik (love it! ), and now I will wait for your new scarf pattern. Really, you did a great job. Such a wonderful daughter! I thought the Sharfik was awesome, but this? Girl, you outdid yourself! I LOVE it! I must make one as soon as you post the pattern. I have some gorgeous Manos waiting to be knit into something…not sure if it will work well for this but I’m excited to try…If not there’s some Malabrigo in the stash as well. That’s incredible! Since you are responsible for my appreciation of Sundara’s yarns (it borders on addiction at this point), I’d love to make that very scarf in her yarn. Beautiful! I love that scarf. So beautiful. I’m sure your dad will love it! Perfect choices! Bet your dad’s gonna love it! Gorgeous scarf! I really like the colour and stitch pattern. Wonderful scarf! And “amen” to Sundara’s sport weight yarn–it is amazing. I made a pair of socks for my husband and they are without a doubt the best looking and performing item I have ever knit. I love following your adventures in knitting, sewing, etc. and appreciate your sharing so much of your family with us. Love the scarf. I’ll be knitting this one up for sure. Great improvements. Looking good there! How about calling Thatched? Well! You did it again. I really enjoy seeing what you come up with next. I’ve been knitting for many, many years and except for socks, always need a pattern (often yours!). I love the stitch pattern. Can’t figure out what it is. Eagerly awaiting the pattern. Though we don’t wear many scarves here in Fla., this one may be worth the time. It looks great – your dad should be really pleased with it. If you are still looking for a name… Arcadia. Nice – I like the herringbone effect in a single color. The stitch pattern is reminding me of “My So Called Scarf.” Waiting eagerly for the pattern; guys are so picky about what they will wear, and this scarf might suit His Pickiness. 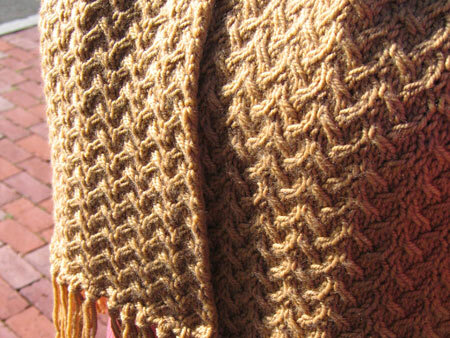 The scarf turned out nicely – what a great stitch pattern! Gorgeous. I’m glad it turned out so well after your initial uncertainty. Your dad will love it. I love this scarf’s elegance…it reminds me that I was planning to knit a scarf for DH last winter and never made it, because I could not find any appropriate gorgeous manly pattern. Now I am looking forward to seeing the pattern…with some gray cashmere-brend yarns from last year, which is happened to be sport weight. i love the stitch pattern. nicely done. The scarf looks great! I know several guys that would love a scarf like it. Can’t wait for the pattern. Very Nice! I love the way this scarf looks. It’s always good when you find a pattern that can be “manly.” They seem to be hard to come by. I’m sure your dad will love it! I love it! The stitch pattern is perfect for a man’s scarf! The scarf is gorgeous! I absolutely love the pattern too…I think there’s one in my future 🙂 And that Sundara is one talented dyer. A thousand thanks for sharing the pattern! I just received a hank of this beautiful stuff, and I think it will be perfect. 🙂 I’m sure your father will love his scarf. Wonderful scarf Kathy. Looking forward to the pattern. I look forward to reading your blog each week. Thanks for the humour and the inspiration to keep on knitting. Really fantastic! I’m completely impressed! It turned out wonderfully. As for a name, may I be so forward as to suggest something? Looking at the pattern I see “wishbone” shapes. And since your father wished for a new scarf, it kind of fits in that respect as well. And if we want to be totally corny… You did finish the scarf in November, Thanksgiving month. And who as a child did not fight over the priviledge of getting to try their luck at the wishbone? Another super project from a super designer! Quite possibly the perfect scarf. I love it. Holy shite: Don’t tell me there’s ANOTHER must-have scarf for Norma? Oh, how I love that, Grumperina! Lovely! I might just have to make one for the man in my life :)! The scarf looks great! You sure have a luck dad! The scarf looks great, I’m sure your dad will enjoy it! I hope you don’t mind…. I like the stitch pattern so much I lifted it to use on the top and cuff of my latest socks. Photo on my blog if you want to see how it looks in pink-with-flecks Koigu.